Mascara is one of the most difficult things to buy. Not because you have to match the colour to your skin tone (like foundation,) make sure it’s appropriate for the season (like blusher/bronzer) or that it’s an on-trend result or shade (like lipstick.) Nope, it’s because you can’t actually see the result before you buy it. There aren’t testers that you can use to see what it will actually look like when it comes out of the bottle and makes its way onto your lashes, there’s just a massively photoshopped model who’s been paid a lot of money to say she’s ‘worth it’. When it comes to mascara I’m cynical and pretty much stuck in a rut. I find it so hard to move away from a mascara I’m happy with, only to be disappointed by other brands that just don’t do the job they promised. So when I like a mascara it’s all fanfares and trumpets… “Roll out the red carpet because this baby is good with a capital G.” You’ll notice that I don’t do a lot of mascara reviews on here, and it’s for that very reason. 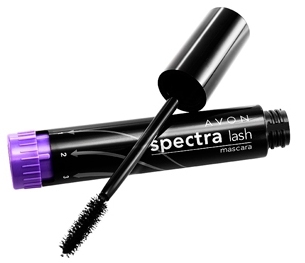 So, when I took the plunge last week and tried Avon’s Spectralash Mascara I wasn’t expecting much – but I’m happy to admit I was wrong. Not unlike the Rimmel 1-2-3 looks mascara, Spectralash has three dials on the base so you can ‘turn up’ your look depending on your mood/the occasion. The first time I used this I couldn’t tell the difference between the three ‘variants’ and wondered if I was doing it right! This is basically because the three dials adjust the size of the hole the wand passes through, so you get a varying amount of product coming out on the brush. The first one is a very tight hole (this is starting to sound slightly ludicrous!) so you get a minimal amount of product, perfect for subtle day looks when you basically just want to give your lashes a coating of colour. The second is what I’d call a ‘work look’ where you don’t want to go all out, but you still want to flutter those lashes at the guy in Accounts. 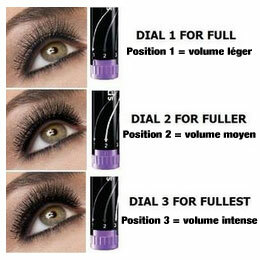 The third dial is pure volume, providing you with a lot of product on the wand without being clumpy or sloppy. The wand isn’t anything special (it’s a traditional brush), but it doesn’t clog up or give you spider lashes. It helps you to define and shape your fringe, even on the third setting. You can really build up a fab result after about 5 or 6 coats that starts to give fake lashes a run for their money. I’m really pleased with this mascara – the one I was using before was amazing so I was fully ready to throw this out in disgust! Not only do you get a fantastic flutter, but it’s also flake proof meaning it stays put all day long with no bits and bobs going astray. I’ve been using it for about 5 days and will definitely be sticking with it! I did attempt to take some photos for you to see my lashes, but my photographic skills have a lot to be desired! Instead I’ll leave you with this….